CarGurus has 21,375 nationwide Enclave listings starting at $4,499. The Enclave, Buick’s entry into the full-size luxury crossover market, was first introduced for the 2008 model year and shares the General Motors Lambda platform with the GMC Acadia and Chevy Traverse. With its chrome waterfall grille, the Enclave is the most distinctive and arguably the best looking of the three; it's also the best equipped and the most expensive by a significant margin, selling for around $40,000. Changes for 2017 are minimal, as this is expected to be the final year for the Enclave's first generation. Other than a cleaner front-end treatment and other minor cosmetic tweaks, the 2017 Enclave is largely the same vehicle as it was before. The only engine available for the 2012 Enclave is a 3.6-liter V6 rated at a more-than-adequate 288 hp and 247 lb-ft of torque. Buyers can choose between front-wheel drive (FWD) and all-wheel drive (AWD), but the only available transmission is a 6-speed automatic that, in a world with seven or eight or even nine gears, reveals the Enclave’s older design. The Enclave can also tow up to 4,500 pounds, enough for light recreational gear, and will do 16 mpg city/22 highway with AWD. In terms of fuel economy, the Enclave is bested by both the Toyota Highlander and the Acura MDX. The Enclave's driving dynamics are basic, as they are for most full-size crossovers, because what matters most is on the inside. A good choice for families who don’t want or need something as spacious as a minivan, the Enclave seats up to eight, with a high seating position for passengers in the second row that doesn’t sacrifice headroom. It is also available with two seats rather than three in the second row, making the third row more accessible. Both the second and third rows also fold down for a total of 115 cubic feet of storage space, making the Enclave one of the roomier vehicles in its class. To make loading and unloading easier, the rear doors can open and close electronically. Up front, there’s a heated wood-trimmed steering wheel, heated and cooled power front seats, tri-zone climate control, and GM’s Intellilink infotainment system with a touchscreen, Wi-Fi, HD Radio, voice recognition, and a USB port. Satellite navigation and a 10-speaker Bose sound system come optional. The 2016 Buick Enclave received a 5-star crash-test rating from the National Highway Traffic Safety Administration and top scores of Good on all tests from the Insurance Institute of Highway Safety, so this is certainly a vehicle to make you feel a little more secure. It has plenty of extra safety features as well, including available blind-spot monitors, rear cross-traffic alert, lane-departure warning, and forward-collision warning. Though older in design, the 2017 Buick Enclave is still a relevant and capable luxury crossover, ideal for a small family. We can expect significant changes when the second-generation Enclave arrives for the 2018 model year. That debut might be worth waiting for, as it's only a little over a year away. On the other hand, those who don’t need the latest and greatest but do want a step up from the Chevy and GMC offerings should be perfectly satisfied with the current Enclave. 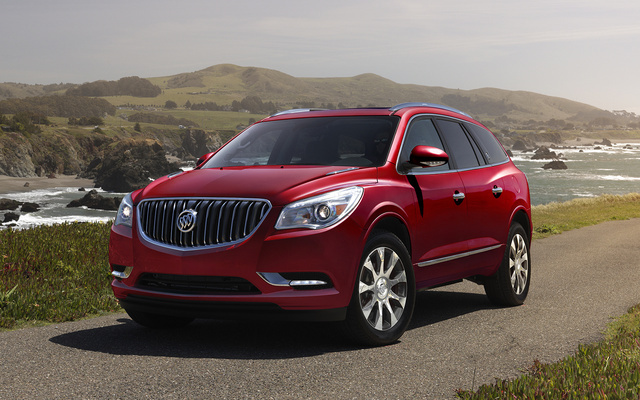 What's your take on the 2017 Buick Enclave? TheHorror That sounds like a pretty nice minivan, but it would be better served with sliding side doors. Users ranked 2017 Buick Enclave against other cars which they drove/owned. Each ranking was based on 9 categories. Here is the summary of top rankings. Have you driven a 2017 Buick Enclave? If you can make the price $33,100 the out of door price, with 60 month warranty for VIN 5GAKRCKD5HJ341871 you have a sell. If I'm in the drivers seat where is a button to open the cargo door for someone to put things in the back.